We'll start with the good news. Iggy Pop has reunited with the Stooges and made a lean punk album that sounds like it time-warped from 1967. That's also the bad news. "The Weirdness," out today on Virgin, is the first album Pop has recorded with the Stooges since 1973's "Raw Power." Pop went on to become a legend with anthems such as "The Passenger" and "Lust for Life," while his bandmates never quite stepped back into the spotlight. These new Stooges are really the same old Stooges, with little regard for the current taste in rock music. Pop is back with the brothers Asheton -- Ron on guitar and Scott on drums -- along with Steve Mackay, the original Stooges sax player, and bassist Mike Watt. You can exhale in relief that "The Weirdness" is not as weird or contrived as the title would suggest. It's a relentless album trying hard to prove itself, with Steve Albini's production keeping the guitars and drums at the forefront, often at the expense of Pop's vocals, which sound a little thin and flat on songs such as "The End of Christianity." The band's sound hasn't changed, but the times have, and so have Pop's songwriting concerns. No longer a down-and-out New York punk, today's Iggy Pop lives in Miami, adheres to a strict macrobiotic diet, and has plenty of money. (See: "ATM." ) He doesn't wanna be your dog these days, but rather, "I wanna be your friend/ To the bitter end/ Baby, but I can't be," he sings on "You Can't Have Friends." Now he's writing from the perspective of a man on the cusp of turning 60, an unlikely survivor who transcended years of drug abuse, self-destructive stage antics, and more than a roll or two in broken glass and peanut butter. Nowhere is this new outlook more apparent and jarring than in the liner notes: "For official ringtunes, go to http://stoogesmobile.com." And how weird is it to hear Iggy Pop mentioning The New York Times's Sunday Styles section on "I'm Fried" ? Very. When Pop does dip back into the punk spirit of the late '60s, it sounds out of place. "My idea of fun/ Is killing everyone," he threatens on "My Idea of Fun," coming across as menacing as Fall Out Boy. It's not as if Pop is totally comfortable with his new status, though. On "Greedy Awful People," he rails against corporate types because "they always clap on the wrong beat/ They're wearing loafers on their feet." Maybe the biggest problem with "The Weirdness" is its lack of dynamics. Whereas "Raw Power" found down-tempo relief in "Gimme Danger," "The Weirdness" kicks out the jams at full throttle, with the exception of the slithering title track. Taking a break from the Raconteurs, Brendan Benson lends harmony vocals on "Free & Freaky," and on "Passing Cloud" Pop slips into "China Girl" mode, sounding droll and disengaged . "Yes, time will be healing me," he sings. Maybe it will, but in the meantime you have to wonder: "The Weirdness" is raw, but where's the power? 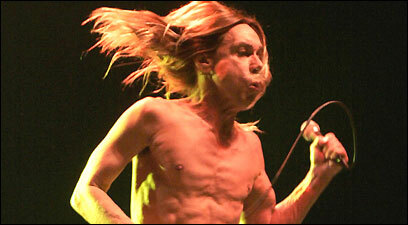 The Stooges are at the Orpheum Theatre April 7.